Two Little Fishies Aquarium Products by AAP. 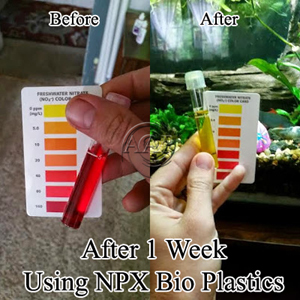 AAP Two Little Fishies NPX Bioplastics Nitrate & Phosphate Reducing Polymer Media is like no other current product!! These AAP Bioplastics polymers (developed by Julian Sprung) provide a time-released source of food for bacteria that can quickly assimilate nitrate and phosphate. 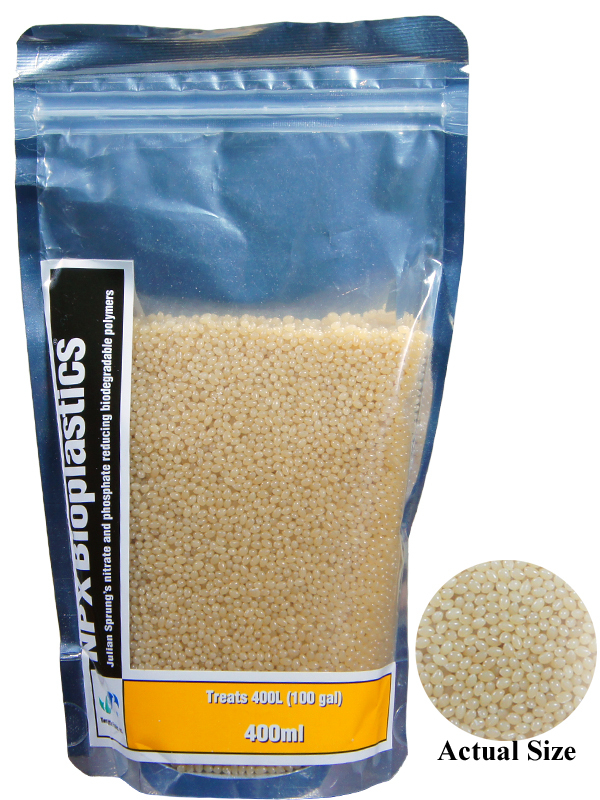 How this product works: Anaerobic zones develop within the Spheres/ pellets, thus promoting de-nitrification there-in. As well, when "churned" in a Fluidized Filter or Reactor, bacteria develop on the pellet surfaces and slough off, then these bacteria can be removed with a protein skimmer or serve as planktonic food for corals, clams, sponges and other filter-feeding invertebrates. •	Use with a Protein Skimmer is generally suggested (although with large amounts filters feeders present, use as a planktonic food can often suffice). Use of an Ozone Generator (connected to a Protein Skimmer) is also sometimes helpful, but not always necessary, as this will help reduce a by product that is possible with these Bioplastics spheres (& more so the Vodka method) called "Gelbstoff" which produces a yellowish water. Since Protein Skimmers generally do not work well in freshwater aquariums, the use of Purigen is strongly suggested for best results. Please note, the Purigen CANNOT be used inside the chamber where it will degrade much too rapidly, rather it is best placed in another filter running on the same tank or at the intake or return of the FSB Filter. •	Make sure your FSB filter or similar reactor is properly tumbling the Bioplastics. This is an awesome product, but not used properly in the proper device, the conditions can become anoxic and allow for hydrogen sulfide production. Running with a pump/filter that powers the FSB filter to the minimum line is important, but as well we suggest the use with silica or oolitic sand too as would be the case in a good FSB filter (such as the TMC) since this sand breaks up the Bioplastics. Thus the better device to use is a FSB filter over a reactor. •	Directions: Use 100 ml Bioplastics per 25 gallons (approximately 100 Liters). After two to four weeks, nitrate and phosphate levels should decrease. Since the "Two Little Fishies" NPX Bioplastics are slowly consumed, more Bioplastic spheres will need to be replenished periodically. 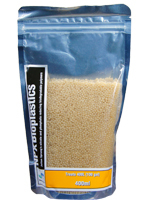 When used in a Fluidized Sand Bed Filter; replace an equal volume of sand with the Bioplastics. It is IMPORTANT to maintain sufficient water flow through NPX Bioplastics to prevent production of hydrogen sulfide gas, generally this is not a problem if placed in high flow area of a wet/dry, HOB, or similar filter (with a properly functioning Fluidized Filter or reactor, this should never be an issue). NPX Bioplastics spheres can affect water oxygen saturation, so good circulation via breaking surface tension with water pumps (such as the Seio propeller pump) and/or air pumps is strongly suggested. •	Two Little Fishies new formula AcroPower supplies essential amino acids that corals need to build their skeletal architecture. Corals, like other other animals from the Phylum cnidaria, have a special ability to uptake amino acids from the water column across their entire surface. •	In a typical reef aquarium with protein skimming and other filtration methods; these deplete amino acids that are vitally important for coral health. •	Delicate Corals such as Montipora & Acropora become more colorful within days due to the extension of the growing margins when Two Little Fishies AcroPower is used. •	Please note that it is NORMAL for this product to clump and become cloudy, especially during colder months when stored in temperatures under 50F. This is similar to how Virgin Olive oil does similar at the same temperatures. Add to a strong current stream for rapid distribution in the water. Dose 5 mL per 94.6 L (25 Gallons) at least once per week, or use a dosing pump. Does not require refrigeration, but store in a cool, shaded location to maintain shelf life. •	For marine aquariums and reef aquariums. •	Color matches coralline algae and live rock. •	Excellent for securing rock, stony corals, gorgonians and aquatic plants. Non-toxic to fish, plants & small animals. Cures dry, damp, or underwater. •	Cures dry, damp, or underwater. 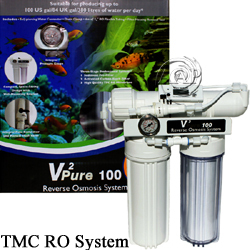 TMC V2; Simply the BEST Fluidized Bed Aquarium Filters. Superior Aerobic Bio Filtration Bar None! Professional quality TMC V2 Skim Saltwater Protein Skimmer as well as the more basic Rio Nano Skimmer for beginner marine aquariums. TMC Bio-Calcium Original Balling Set; Parts A/B/C.